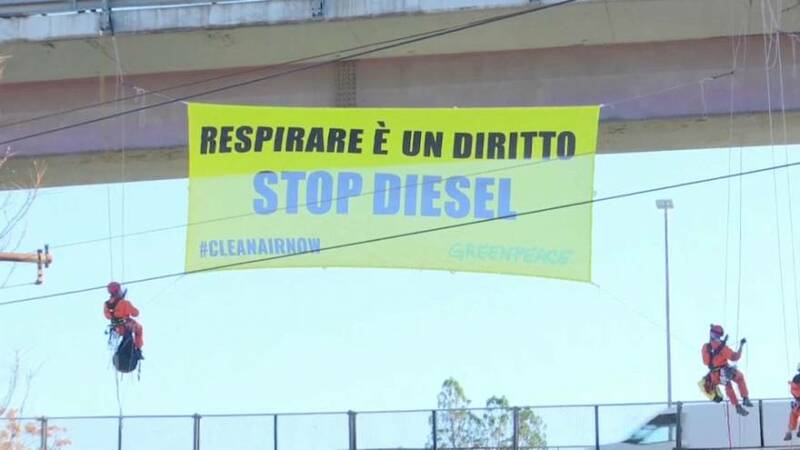 Greenpeace have protested in Rome against diesel air pollution. A banner reading “Breathing is a right, stop diesel” and two lungs drawn full of smoke were hung from one of the city’s busiest roads. “Millions of cars on our roads are in fact illegal as we have learned from the ‘dieselgate’ scandal. They emit enormous amounts of Nitrogen dioxide, a pollutant that is responsible for more than 17,000 premature deaths per year in Italy, a sad record in Europe,” said Greenpeace’s Andrea Boraschi. Greenpeace monitored the air quality in front of 10 schools around the city in recent weeks, finding an average concentration of Nitrogen dioxide higher than the safety limit set by the World Health Organisation of 40 micrograms per cubic metre. “In many cities and in Europe as well a decision has been taken about the date beyond which diesel vehicles won’t be allowed to circulate anymore. It is a decision that we have to take very soon in Italy as well. Our mayors, like Virginia Raggi, have to act because they are responsible for protecting our health,” concluded Boraschi.